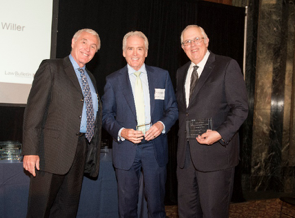 Congratulations to Corboy & Demetrio Partners Philip Corboy, Jr. and Edward G. Willer who received a Trial Lawyer Excellence Award from the Cook County Jury Verdict Reporter in a $6 million settlement in a premises liability case. The award was presented to them on Oct. 19, 2016 at the 7th Annual JVR Awards, which recognizes the case and career achievements of Illinois trial lawyers. More than 300 trial attorneys and judges were in attendance for the reception and awards ceremony. Corboy & Demetrio is one of the nation’s premier law firms. The personal injury law firm represents individuals and their families in serious personal injury and wrongful death cases and is renowned for its achievements in the courtroom and for its contributions to the community. The Chicago law firm has acquired more than $4 billion in settlements and verdicts and has attained more than 700 settlements and verdicts in excess of $1 million. To contact Philip Corboy, Jr., Edward G. Willer or another Chicago personal injury lawyer at the firm, call 312-346-3191 or toll free at 800-356-3191. We are available 24 hours a day, seven days a week. For more information about our law firm go to corboydemetrio.com.